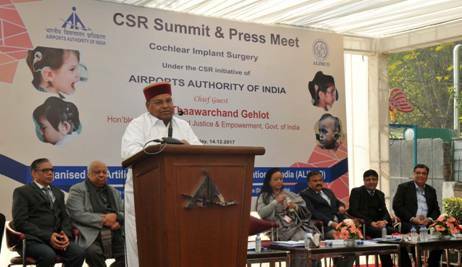 New Delhi: Thaawarchand Gehlot, Union Minister for Social Justice and Empowerment inaugurated the “CSR Summit for Pioneering Cochlear Implant Surgery under CSR initiative of Airport Authority of India (AAI) through Artificial Limbs Manufacturing Corporation of India (ALIMCO)” here today. Smt. Shakuntla Gamlin, Secretary, DEPwD, M/o Social Justice and Empowerment, Shri Guruprasad Mohapatra, Chairman, AAI, Shri D.R. Sarin, CMD, ALIMCO and senior officers were present. A few children, who have overcome hearing and impairment and have started to hear and respond (which is not less than a miracle) with the Cochlear Implant Surgery under CSR initiative of Airport Authority of India (AAI) through ALIMCO were also present along with their parents and they communicated with the guests on the occasion. Addressing on the occasion, Shri Gehlot said that an estimate shows that around 35,000 children need Cochlear Implant annually in India. Government of India has made provision to sponsor 500 numbers under the ADIP Scheme which is minuscule in comparison to actual requirement. Till date more than 1000 number of Cochlear Implant Surgeries have been successfully conducted in the country under the ADIP Government of India and CSR funds. He opined that it is very heartening that Public Sector Undertakings and Corporate sectors are coming forward to fulfill their social responsibility by helping the Persons with Disabilities (Divyangjans). He congratulated Airport Authority of India (AAI) and Power Finance Corporation (PFC) for their initiative. He called upon people and organizations to come forward in this noble mission. AAI sponsored Cochlear Implant surgeries for 115 children with profound hearing loss under their CSR project implemented by ALIMCO on the occasion. Cochlear Implant Surgery and post-operative rehabilitation are undertaken by Ali Yavar Jang National Institute of Speech and Language Disabilities (Divyangjan), Mumbai. This major CSR initiative of AAI will help the children to completely overcome their hearing disability, thereby enabling them to hear and speak coherently and making them fully independent to lead a normal and productive life. This effort will not only bring these underprivileged children to the mainstream of life but will also contribute to national economy. This summit was organized to showcase the success of the Cochlear Implant surgery initiative under the CSR and to introduce the Children who have overcome hearing and speech disability and started hearing and speaking which is not less than a miracle. The event would highlight impact CSR Project had made on the lives of these children and their families and how it would eventually bring them in the mainstream of life. The event is an effort to sensitize various organisations to come forward for the noble cause of supporting hearing impaired children under their CSR initiatives. Today, CSR in India has gone beyond merely ‘Charity and Donations’. Corporate Social Responsibility (CSR) acknowledges the corporation’s duty that the corporation owes to the community within which it operates. It regards the community as an equal stakeholder. As per provision of Company Act 2013 it is now mandatory for all companies to contribute 2% of their 3-year average annual net profit on their CSR activities as mentioned in Schedule VII of the acts with effect from April, 2014. Further added in Scheduled VII there is provision of aids and appliances to Divyangjans under ‘Promoting Health and Care including preventive health care’. Activities undertaken by corporates under their CSR obligation could prove a game changer for providing sustainable development in Social Sector. Disability sector is one of the area which needs to be addressed for inclusive growth of the society and CSR provide the huge opportunity to serve the persons with disabilities that fall under vulnerable section of society. AAI and ALIMCO signed MoU on 4th September 2017 at Rajiv Gandhi Bhawan, New Delhi for conducting Cochlear Implant surgeries of 100 beneficiaries for FY 2017-18 on PAN India basis valuing Rs. 669.00 lakhs under the CSR initiative of Airport Authority of India. Cochlear Implant surgeries are done through Ali Yavar Jang National Institute of Speech and Language Disabilities (Divyangjan), Mumbai under Department of Empowerment of Persons with Disabilities, Ministry of Social Justice and Empowerment, Government of India. A similar MoU was earlier signed by AAI with ALIMCO for FY 2016-17 for Rs. 100 lakhs in which AAI had sponsored Cochlear Implant Surgeries for 15 children which have already been completed successfully through Ali Yavar Jang National Institute of Speech and Language Disabilities, Mumbai. Post- operative rehabilitation is undertaken by Audiologist and speech language pathologist and special educator of Hearing Impaired.